Mathayus is a legendary warrior but his people face a deadly foe in the form of Memnon and his evil army that is sweeping through the lands. 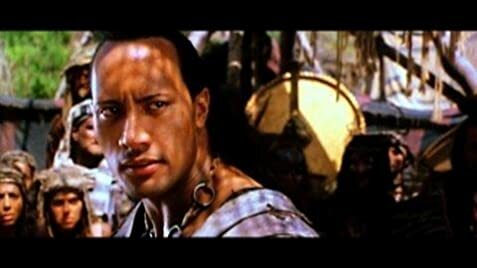 Despatched to assassinate Memnon, Mathayus is forced to save a child and misses his opportunity. Fleeing the city, he kidnaps Memnon's sorcerer Cassandra (who he is also meant to kill) and heads into the desert. Deep in the Valley of the Dead, he intents to use Cassandra to draw Memnon out of the safety of his loyal city and into the desert where he will be more vulnerable and easier to kill. Despite not being impressed at all by Mummy Returns, I thought I would veg out in front of this prequel/sequel/spin off thing which was just as well since vegging out mindlessly in front of it is pretty much all it is good for. The plot is essentially a collection of action scenes held together by some overly-serious plot with a bit of flesh and titillation thrown in just in case the teens get restless. It is very derivative and very obvious and, if you are actually paying much attention to it then you'll find it pretty tiresome at times. Of course in my brainless state I found it to be brightly colourful and noisy which was enough to keep my eyes busy and let my head rest. It would have been much more fun if the material had had its tongue in its cheek and allowed the performances to match this, but by taking itself a bit too seriously at times it only ends up looking silly. The Rock is a solid star for this sort of thing but he isn't very versatile  he needs the material to match him rather than the other way round. By having a big character in an overly serious tale, he looks ill at ease and doesn't suit it that well. Brand is a by-the-numbers villain who fills the role but not much else. Hu is undoubtedly attractive and at first I felt that she was being exploited by having her in tiny clothes and as much flesh as possible; however then I watched her performance and realised she was just playing to her strengths. Duncan takes himself too seriously and his scenes lack fun  surprisingly even in the action scenes. Support from Hill, Heslov and others don't do much other than fill out the cast. Overall then a fairly bland, uninspiring action movie that lacks excitement, tension, characters, story and indeed fun (which is where the biggest problem lies). It is probably enough of a film to satisfy teenage genre fans but I must confess that there was so little that was special that I could barely care about it when it was on and found it unmemorable by the time it was finished. The DVD special features include a 100-minute version of the film, with all of the deleted, extended and alternate scenes that were cut from the theatrical version. Barbarian Chieftain: We have killed Babylonians! Barbarian Chieftain: We have killed Mesopotamians! Barbarian Chieftain: But we have never had the pleasure of killing... an Akkadian. Jesup: May the gods have pity on you, for my brother will not. Mathayus throws a rope from the top of the wall down to his camel, and it hits the camel. After he climbs down, the rope is a few feet shorter. There are no opening credits, only with the Universal logo and the title for the film at the beginning. In the UK the distributor, UIP, removed a headbutt in the final fight sequence between Mathayus and Memnon after advice given to them by the BBFC. This was done to obtain a more commercial '12' rating. Courtesy of Universal Records, a Division of UMG Recordings, Inc.